- Friday was the first cinema in England for me! It's strange the fact that characters speak all the time in English, but I thought that it would be more difficult for me to understand but the language hasn't been a problem for me! But the story... 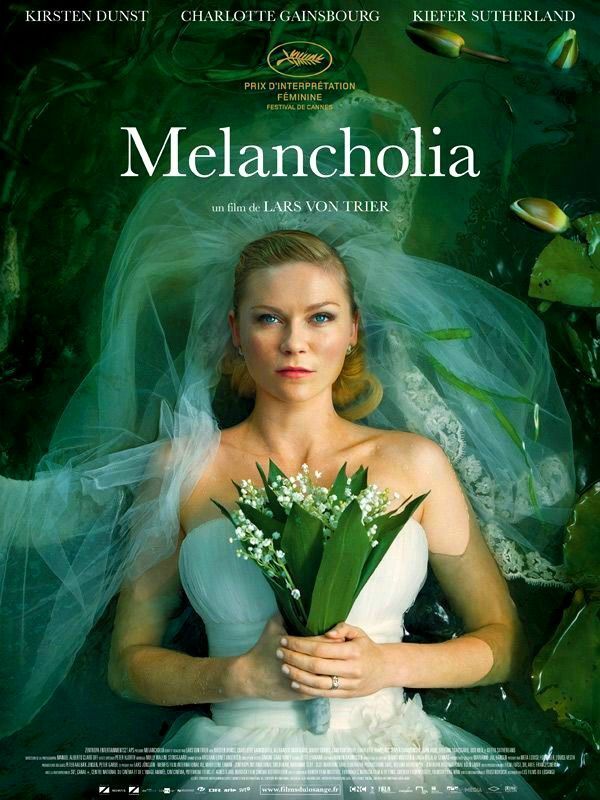 Already I did not like the last movie of Lars Von Trier (Antichrist) but I thought that this movie would be better! WRONG! The story is very long, people don't speak, the action is very slow... But I want to underline one thing, the movie remain very hooking with the play of actresses and actors !! Lars Von Trier's Melancholia, a meditation on depression and the end of the world, stars Kirsten Dunst as the emotionally troubled newlywed Justine whose sister Claire (Charlotte Gainsbourg) throws her a lavish wedding party. As her lack of emotional stability begins to take a toll on Justine's brand new marriage as well as the party - and old wounds are exposed - Claire's wealthy husband John (Kiefer Sutherland) knows a great deal about a planet that is on a possible collision course with Earth. The second half of the movie focuses on Claire, who ends up taking her sister in after the marriage collapses, and also begins to fear that John is hiding apocalyptically bad news . So I'm obviously disappointed (I didn't imagine this) but not sorry because it's necessary to see the acting of actors. It is impressive! "Dunst and Gainsbourg are both fantastic in starkly contrasting roles ." not easy a movie english! ça n'a pas du être facile de comprendre les paroles! !ce film a l'air sympa! !j'adore Charlotte!! Who knows, I might like it. I really liked the two other Lars Von Trier movies I saw , so now I am very curious. I found your review very interesting. I would like to see this film ! If you read what I written, you'll understand that it was not difficult for me to understand even if it was in English! The only problem is that the movie is not very interesting! It's very long, slow, there isn't action! But the playing of actors and actresses is great!